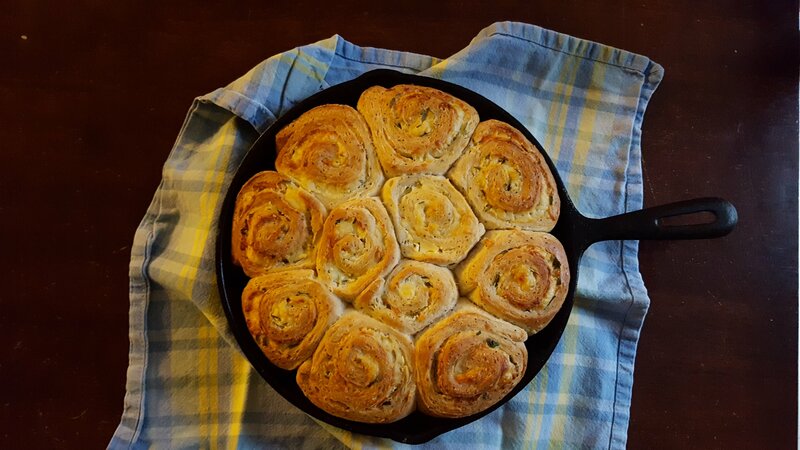 So, it should come as no surprise that I re-purposed this super easy cinnamon bun dough to make some savory delights. Of course, I made sure to make some of the original recipe*, as well. Because they so delightful slathered with cream cheese frosting. And maybe, just maybe I can keep the kids away from the savory ones that I like to enjoy with a glass of red wine. Preheat oven to 350 degrees. Grease a 9 or 10 inch cast iron skillet. In a large mixing bowl, combine flour, baking powder and salt. Heat milk, sugar and butter on low until mixture reaches 110 degrees. Remove from heat and add yeast. Stir to combine and add mixture to flour mixture. Mix with a rubber spatula, dough should be sticky. Turn out onto a lightly floured board and knead for up to 5 minutes. Form into a rectangle and roll out with a rolling pin to am 18″ by 12″ rectangle (approximately). Spread cream cheese over rectangle. Sprinkle chives all over rectangle, leaving about 1/4″ of one long edge without chives. Do the same with the shredded cheddar. Roll up dough the long way, starting with the edge that has chives and cheese and leaving the clear edge until the end. Cut into 1 1/2″ pieces (about 10 is best) and lay on side in cast iron pan with the cut side up showing the swirl. Leave a little space between each roll. Cover with wrap and allow to rise for up to 30 minutes until rolls begin to swell and appear larger. Brush the tops of the buns with 2 tablespoons melted butter. Bake in oven for 25-30 minutes until buns begin to brown on edges. Remove from oven and place on a rack to cool. Serve warm or at warm temperature with dinner and/or cocktails. 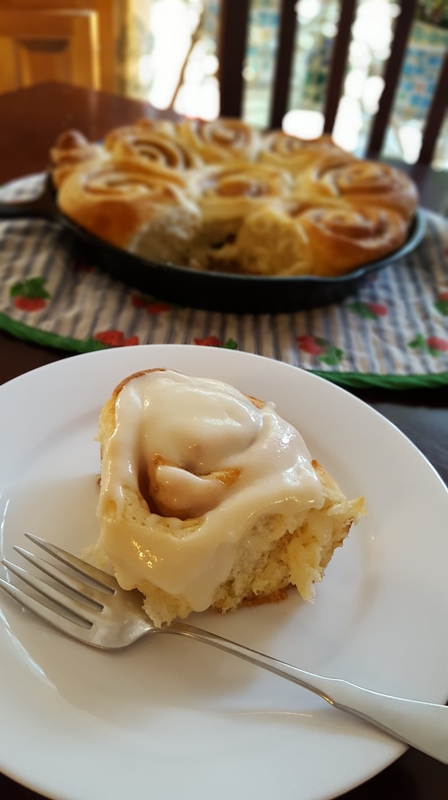 *I changed the Glaze on the original Cast-Iron Cinnamon Buns recipe by America’s Test Kitchen to a frosting. Instead of melting the butter, leave it at room temperature and combine with the other ingredients. You get a thicker spread of frosting on top of your cinnamon bun, with is always preferable!